Tonight, I’m getting festive with my jelly jar full of Cranberry Margarita, because everyone’s healthy. Because the tree is up and lit. And because my latest car repair cost less than $3. Amen. To make the margaritas, fill a cocktail shaker with ice; combine the cranberry juice, tequila, Triple Sec and lime juice; and, in the words of recipe writer Rebecca Rather, shake like hell. Then strain the margarita mixture into some glasses full of ice, and start sipping. If you’re feeling particularly festive, you can garnish the drink with thinly sliced limes, fresh cranberries or a small ornament threaded with a skewer. To make the sugar rim, just run a wedge of lime around the edge of your glass, and dip it into a saucer of sugar. Because it’s pretty. Because everyone’s healthy. And because my latest car repair cost less than $3. Hallelujah! Hallelujah! Run a lime wedge around the rim of the glass, and dip the edge in sugar to coat. Fill glasses with ice. Set aside. In a cocktail shaker filled with ice, combine all the ingredients, and shake like hell. Strain into ice-filled glasses and serve. I love margaritas and I've never had a cranberry one. So festive – I'll have to try these. Let me know what you think! I love the red. Puts me in a good mood right away. See, this is exactly why I have a cocktail shaker on my Christmas list. Shake like hell, baby. We got one as a wedding gift! Swankadelic. WOW.. great posting as hubs just adores both the margarita part and the cranberry part!!! Oh, gonna make the mirco wave peanut brittle today! Oooh, can I come over? That is such a festive drink! Love it, especially the sugar and Christmas ornament. I love the green crystal sugar and the ornament. So cute! I'm addicted to cranberry anything so I can't wait to make this! Thanks! Hope you love it. i love cranberries. i love margaritas. i love christmas. essentially, i love this blog haha. and will obviously have to make this for my slumber party on friday! btw, very jealous that your car repair only costs $3. mine's been in and out of the shop for awhile now and i just can't afford it! Thanks! A slumber party? I'm SO jealous! I feel you on the car repairs. Both of our cars have needed repairs ALL YEAR, so I was over the moon about this one being $3. My brakes had totally gone out. And the problem was… old brake fluid. So, a new bottle fixed them. Good luck with your car! Hope it behaves for you. Mommow is supposed to drink cranberry juice and she thinks this would be perfect! I can see her with a mason jar full of cranberry margarita. Maybe we can hang a little jingle bell off of it. we could hang a little jingle bell off her! Huzzah! Takes the edge right off the ho-ho-holidays. Drooling. Must mark this recipe for after the baby comes. It looks so yummy! Yes, you'll definitely deserve one of two of these after the baby. Congratulations! Yes please! 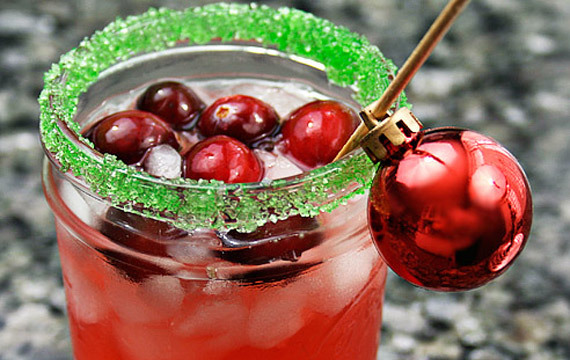 I love anything margarita….cranberry sounds festive and perfect. My favorite drink ever– Cranberry Margaritas! This recipe reminds me of sangria with tequila! I am limited to only drinking one or I can't drive home! I also love these because they are such a fantastic cranberry color–very festive. 5 Things – Sprinkle Joy. Previous Post Venison Lasagna. You Game?